U.S. Defense Secretary Jim Mattis, center, speaks during a meeting with China's Defense Minister Wei Fenghe at the Bayi Building in Beijing, Wednesday, June 27, 2018. 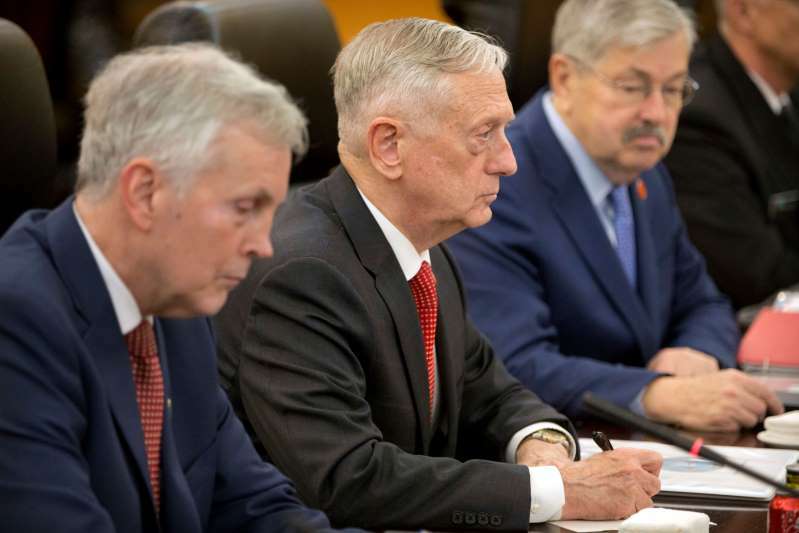 U.S. Defense Secretary Jim Mattis and his Chinese counterpart struck a positive note as they sat down Wednesday to tackle the thorny issue of how to get North Korea to fulfill a pledge to abandon its nuclear program. Wei said the visit is important to increase strategic trust and enhance the cooperation between them. In a later meeting, Chinese President Xi Jinping — who also heads the commission overseeing the People's Liberation Army — called relations between the militaries a "model component of our overall bilateral relations." "So I'm here to keep our relationship on a great trajectory, going in the right direction," he said. None of the leaders mentioned specific issues in their opening statements in front of reporters, but North Korean denuclearization was expected to top the agenda.